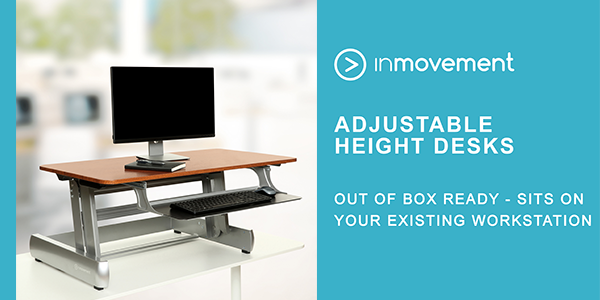 Tell your clients, tell your friends – from Black Friday through to the week of Cyber Monday, InMovement are offering $125 OFF RRP of their DT2 Sit-to-Stand Desks! Healthy employees are effective employees, and right now is a great opportunity to end the year on a productivity high! Professionals report increased energy by alternating between sitting and standing throughout the day, so by introducing sit to stand desks into your workplace, you’ll be boosting the health of your team and encouraging a more active workplace. It’s a small investment for a healthier and more productive team. Why the Elevate DeskTop DT2? It comes fully assembled and has ten different adjustable height settings. Installation is a simple as placing the InMovement Standing Desk on top of your existing desktop, grasping the handles, and adjusting the product to your desired standing height. A retractable keyboard tray keeps your keyboard and mouse at the ideal ergonomic height. At 41″ across, this executive-sized desk allows for a fully functional workstation. The DT2 is available in three high-end finishes to complement any workstation. Choose from a contemporary light grain, rich dark grain or modern white finish. Now is the best time to deliver or recommend the gift of good health! Note: Offer expires at midnight on 2 December 2016 (AEDT). Conditions apply.